This home is perched on an East Bay hill amid a grove of oak trees. 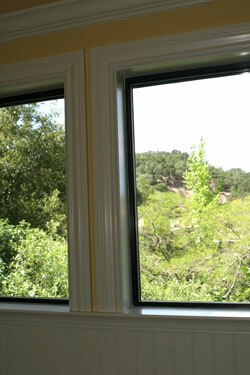 Bay windows in the living and dinning rooms give the feeling of living in a tree house. To finish the effect, the owner asked Moulding Masters to trim the home thoughout with moulding framing the views of the oak trees. The results are spectacular, bringing a cool, crisp look to the home and putting emphasis on the spectacular bay windows. Mouse over images for larger view. a coffered ceiling above the dining area. Moulding masters skillfully joined the bay window to the original wall, framing all the elements with moulding. Colors: the interior walls are a burgundy color, showing off the moulding and providing a great accent color to the olives, dove greys, soft mustards of the East Bay hills. Joining of bay window moulding to dinning room wall, requires expert carpentry techniques. Once again, we encourage owners to take advantage of our staff's expertise, finding solutions for problems like this. Before you give up on your idea, give us a call to see if we can make your idea work. Problem: measurements say moulding for sliding door will not fit. 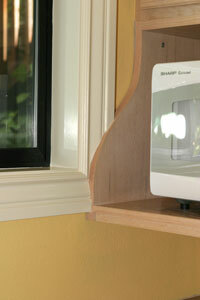 Solution: Moulding Masters shapes moulding around cabinet. 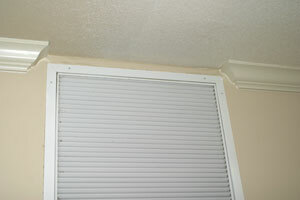 Here is a very common problem: what to do with wall vents located close to the ceiling? Again, what was a problem becomes an asset. 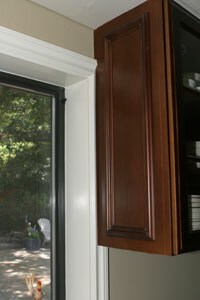 Returns on the crown molding look very finished and allow the moulding to fit around the vent in an attractive way. Even if you are doing your own installation, let us help you solve problems like this! Our staff has years of experience as finish carpenters. 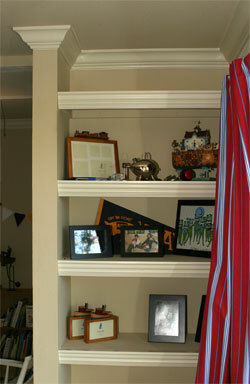 Molding can be used in many creative ways, such as edging shelves, improving this display area. See detail below. Colonial Crown was used in this room. Click here to see Colonial Crown in catalog. 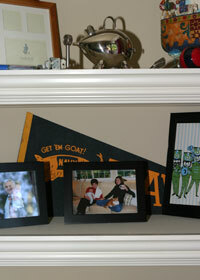 Close up of moulding on shelf edges. One of the reasons this project is so successful is the owner selected great wall colors. 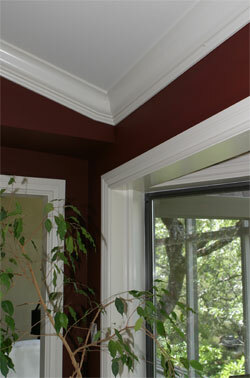 To get the best effect from trim it is important to have strong enough wall color. Even if you are working with a neutral palette, the color needs to provide contrast to show off the shadow lines of the moulding. 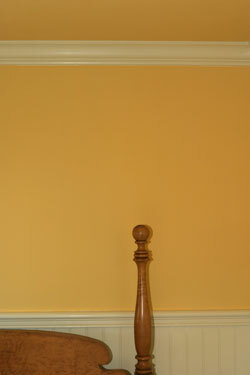 The owner used this cheerful squash color for the guest house. 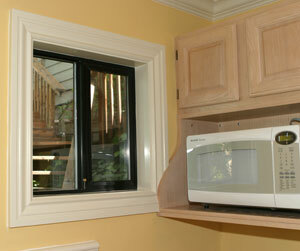 Here is the guest house kitchen, where the shelving for the microwave abuts the chunky moulding of the window. See detail below. Note: in addition to providing good contrast to the moulding, the bright and cheerful color makes the rooms look larger. Close up shows skilled carpentry techniques to join microwave shelf to window casing. 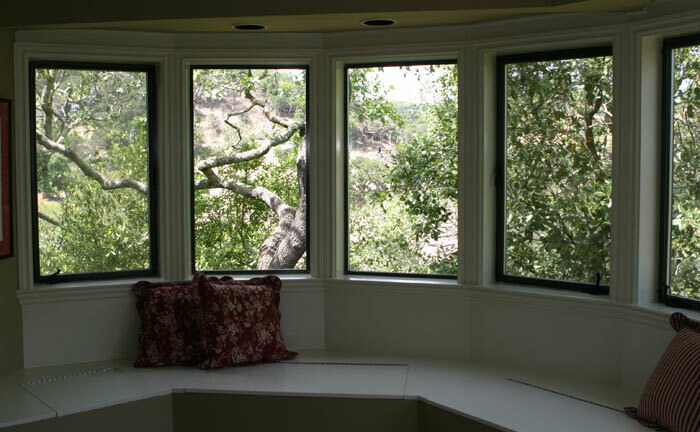 Windows sit at the chair rail level in guest house. 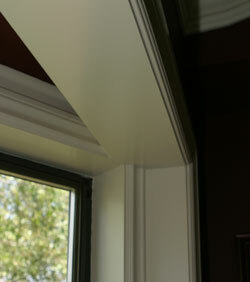 Note use of "chunky" size casing and moulding in this project. This can update a room or home built in the 1970s and give it a contemporary look. The bedroom features beadboard and chair rail, providing a traditional look for the charming antique American bed with tiger and birds eye maple.